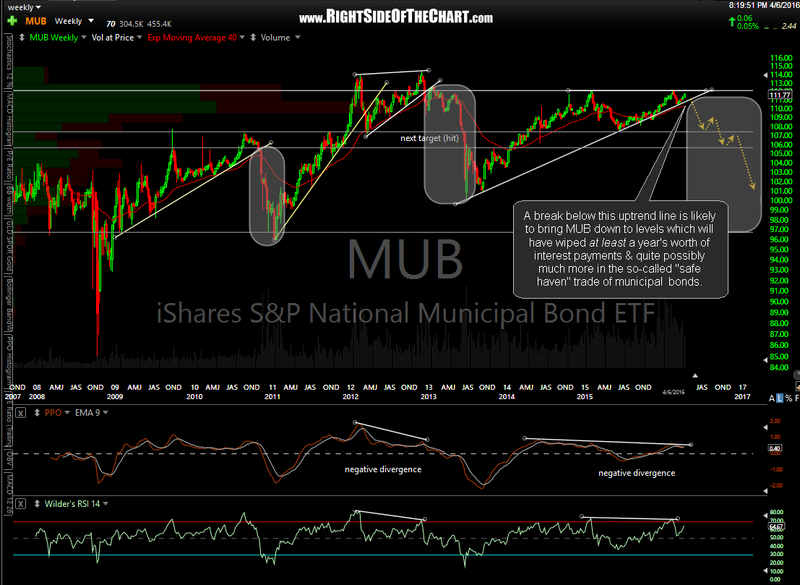 So far that scenario has played out as predicted, with a very impulsive sell-off in municipal bonds since prices broke down below the uptrend line and MUB falling 4% since the breakdown, effectively wiping out nearly 2 years of dividend payments on this so call “safe-haven” investment. 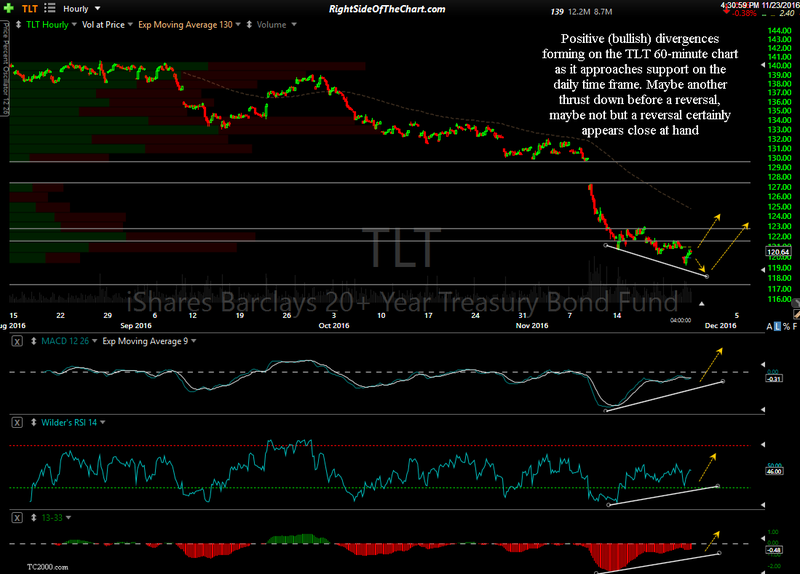 Similar losses have been incurred in US Treasury bonds in recent months with TLT (20+ Year Treasury Bond ETF) plunging about 17% over the last 4½ months, also wiping out years of dividend payments or for those that bought near the recent highs, it will take many years of future dividends -or- a gain of over 20% from current levels just to get back to breakeven on their so-call safe-haven investment. 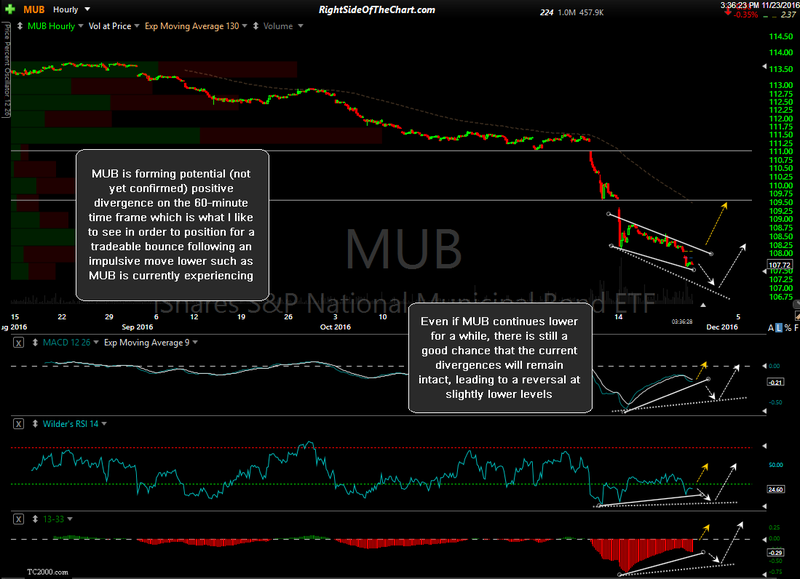 While MUB wasn’t added as an official short trade idea (I don’t often swing trade bonds & prefer to go long when I do), like much of the analysis posted on Right Side Of The Chart, the warning of a significant correction in muni bonds, which peaked 3 months after that post, could have helped to advert substantial losses for those either looking to purchase, add to or already positioned in municipal bonds or other safe-money fixed income investments such as treasuries or investment grade corporate bonds (the latter of which have lost nearly 7% of their value over the last 3 months, wiping out 2 years of interest payments). Congrats to those that either profited from the recent carnage in investment grade bonds or at least managed to advert or cut their losses. Of course the big question is “where do bonds prices go from here?” At this time, I’m still sticking with my scenario from April that MUB, as well as TLT & LQD (investment grade corp bond ETF) are likely to reverse soon & mount what I like to refer to as a tradeable bounce, i.e.- a bounce lasting for more than just a few days & gaining more than just a few percentage points. My reasoning is based on several factors including the fact that the aforementioned trio of investment grade bond classes are either at, below or very close to oversold readings on the weekly RSI that have historically preceded significant trend reversals (i.e. 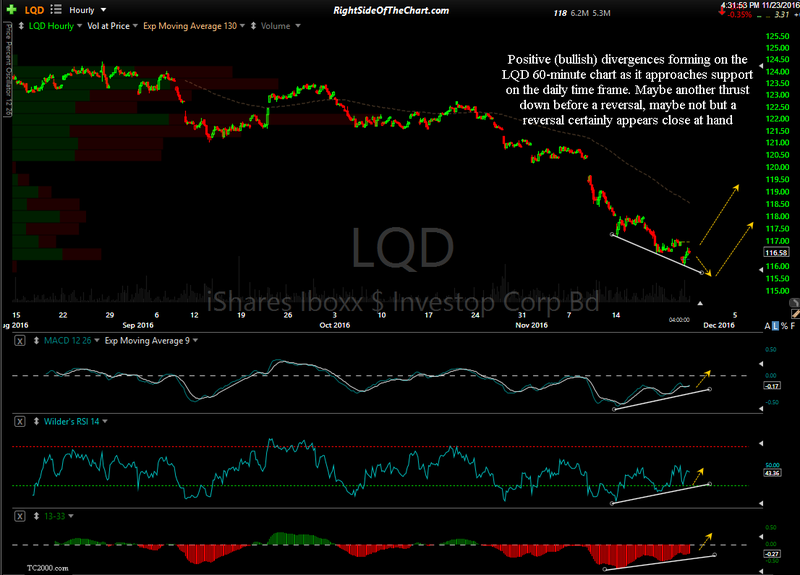 – rallies following a downtrend). I also have all three at or very close to decent support levels on the daily and/or weekly time frames with potential bullish divergences setting up on the 60-minute time frames. Additionally, I suspect that between now & the FOMC meeting on Dec 13-14, the stock market will begin to throw a hissy fit to remind Mama Yellen that even if she has already pretty much boxed the Fed into a rate hike at the December meeting, she better follow-up with some very dovish statements that pretty much say that the Fed doesn’t plan to follow up with another cut anytime soon. If my assumptions are correct, that has the potential to spark a nice, fat “buy the rumor (of a rate hike), sell the news” correction in the US dollar which has already most certainly experienced the “buy the rumor” part of that two-part process. Bottom line is that the R/R, at least for the next several weeks, is starting to rapidly shift from being short to getting long investment grade bonds (not junk bonds.. more on that later) for at least a bounce trade. 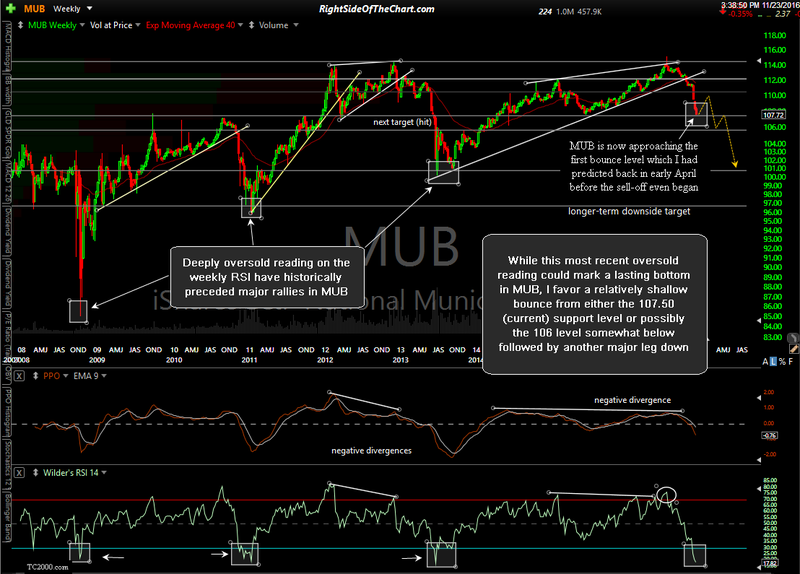 However, taking several variables into account, I don’t expect the next rally in bonds to match or even come close to the previous rallies that followed similar overbought conditions on the weekly RSI although I’ll continue to monitor the charts if/as soon as a rally in bonds begins to materialize and share my thoughts if they change.